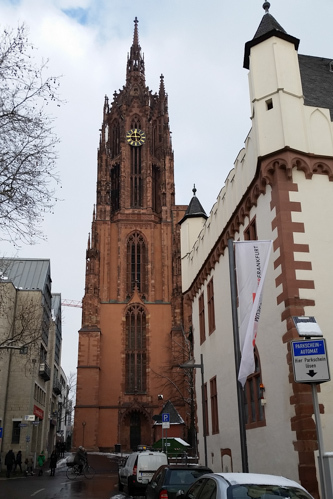 Since it is Monday [December 29th] and all museums are closed I decided to make my day a pilgrimage and walk from church to church in the old city. Over 90% of the old residential center of the city was leveled during the bombing so once again I marveled at the ongoing rebuilding and reconstruction of ancient buildings. When I see photos after July of 1945 I am stunned. Photo of city after bombing. Notice the tower of the cathedral. 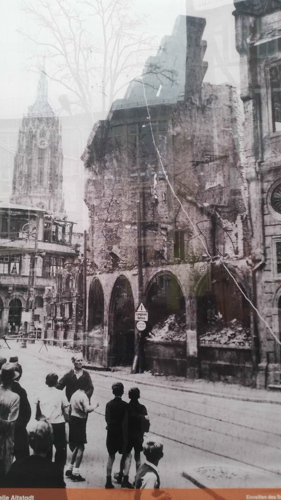 Notice the tower in the photo which stood even in the massive bombing. But even more chilling is this one from the tower of the cathedral. 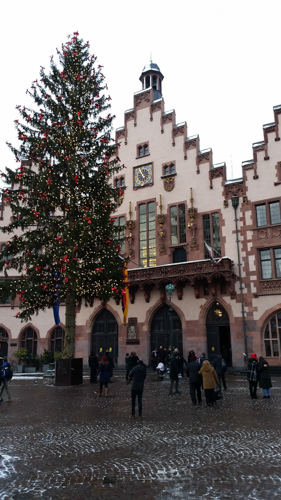 Walking through the streets of the old town I have come to deep appreciation of all the efforts to restore what was destroyed because all this reconstruction and preservation keeps alive a vital part of our western cultural heritage. 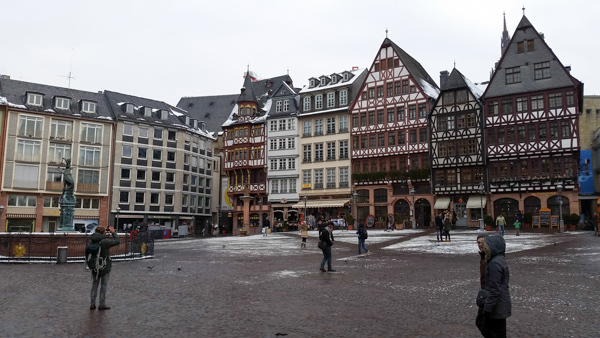 The Romer Platz was completely leveled however was painstakingly restored. 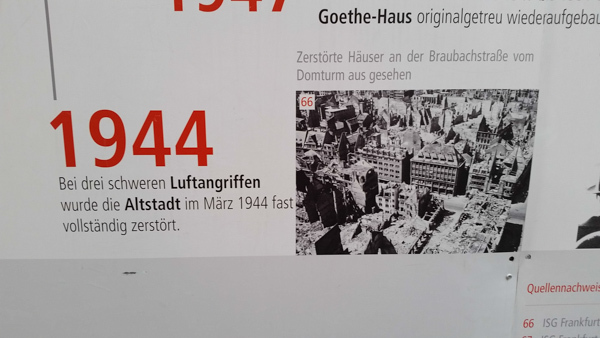 These are of the Romer Platz that was leveled in the bombing. 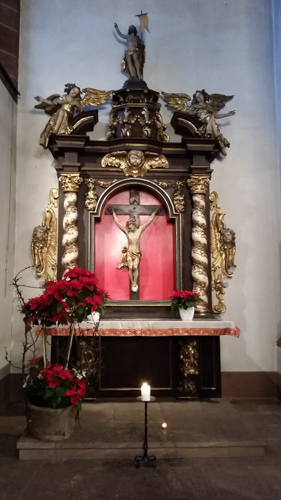 The 17th century altar immediately caught my attention. 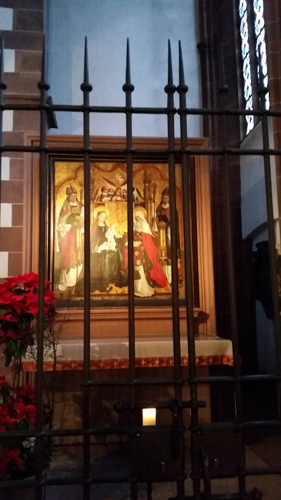 Fragments of the high altar were salvaged and reconstruction began. The church was so quiet and is an oasis on this busy part of town. 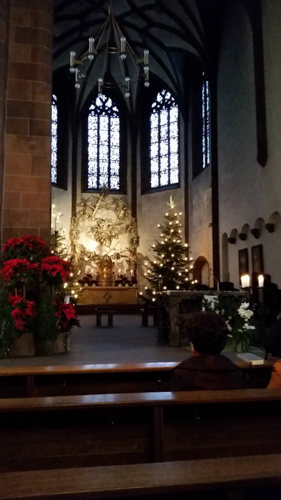 And it was wonderful I arrived as daily Mass was beginning. On Monday there were a little over 100 in attendance and everyone sang accompanied by the 2008 Karl Gockel organ. Over these past few weeks I have grown to love the German hymnal but even more how German Catholics are serious when they sing! There were other pieces art that attracted my attention. 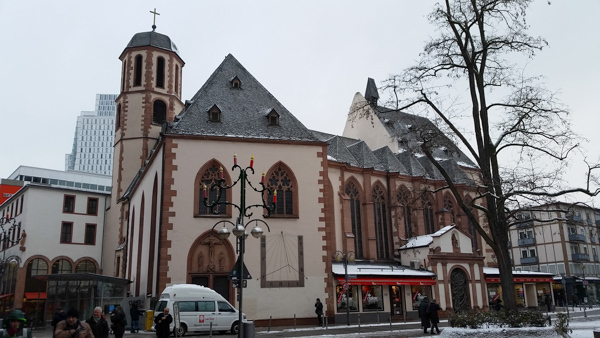 After Mass I walked over to what is called Romerberg after remains of ancient Roman settlements. This too was destroyed however this complex of buildings was restored. 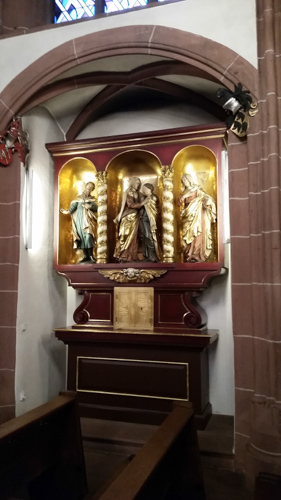 This entry was posted in Church Architecture, Europe, Faith and tagged Frankfurt, Germany on January 20, 2015 by frjfkauffmann.